Pattye Williams Kender, 66, passed away peacefully in the arms of her husband, Sunday morning, March. 17, 2019, only days after being diagnosed with pancreatic cancer. She is survived by her husband, Tom Kender, two daughters, Kelly Hamilton Garza and Kassidy Hamilton Hardee, her mother, Margaret Dougherty, brothers F. Clark Williams, jr. and Matt Williams, and two sisters “Margie” Terrell and Laura Smith and her loving grandchildren: Lisa, Chloe, Caleb, Nathan, Owen and Brendon. Pattye was born in Greenville, South Carolina Sept. 14, 1952 to Margaret Achilles Williams and the late Clark Williams. Her early years were spent in locations in north Louisiana as her father, a Presbyterian minister, served different congregations. Pattye loved listening to her father’s sermons and often remembered her childhood home in Sibley, Louisiana, which she had opportunity to visit just a few years ago while on vacation. Pattye attended Captain Shreve High School in Shreveport, LA. up to her junior year, then graduated from Richardson High School in Texas, after her family moved to the Dallas area. She attended Trinity University in San Antonio on an academic scholarship from the Presbyterian Church. She worked several years for March Exploration in Dallas as a bookkeeper and office manager. Her attention to detail in every aspect of her life–both in business and home–made for success in its every facet. Pattye and husband Tom founded Blue Sky Pools in 1989 working side by side cleaning, repairing, and remodeling swimming pools as the company grew and now celebrates its 30th anniversary. She also was a Circulation Contractor for the Dallas Morning News (DMN), twice honored as Contractor of the Year by the DMN and later named Contractor of the Year for all newspapers in the State of Texas. A Girl Scout leader when her girls were young, Pattye enjoyed camping trips with both the Girl Scouts and her family always taking charge as the “official” fire starter. After retiring from the DMN, she opened a successful antique store, “Gathering Eggs”, which she filled with antiques and collectables that she found while she and Tom travelled throughout Texas. Pattye had a passion for music which began as a child singing in the choir in her father’s churches. She was an accomplished pianist as well as a self-taught guitar player. Christmases included her playing the piano while family gathered round to sing favorite carols. In the late 1980s, she sang tenor with the world-acclaimed “Richtones” Barbershop Chorus for Women. In her 60s, she began to paint in oils, mostly landscapes of places she had visited. Her beautiful paintings adorn her home and after family members and friends select work that they want to remember her by, the remainder will be donated to a local hospital. Her last nine years were spent as a caregiver for her late Aunt Audrey and Uncle Bob, whom she brought to Dallas and placed in a home in Richardson after failing health prohibited them from taking care of themselves. Pattye was sure to attend every holiday occasion at the home and kept them close to her heart. Pattye was a perfectionist in whatever job or task she chose and as a result everyone prospered. She was a private person but participated in events. She loved singing, dancing, and most of all, she enjoyed life. There will be a private celebration of her life in April and she asked that her ashes be spread at a beach, a place where she found solace. 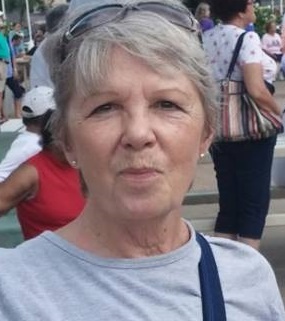 Her family has requested that in lieu of flowers donations be made to the Pancreatic Cancer Action Network https://www.pancan.org/ in her honor.